Hassan Nasrallah’s speech about the Special Tribunal for Lebanon’s (STL) indictment was a spectacular display of political theatre. 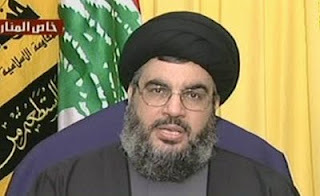 We have become accustomed to the Hezbollah leader’s master performances, and today he did not disappoint. The speech had all the usual ingredients: criminal evidence, intricate conspiracies, and a defiant but reasoned political message. It seems that Nasrallah is pinning his hopes on winning the public opinion battle by undermining the credibility of the STL and dissuading his opponents in March 14 from pursuing its agenda. Nasrallah is definitely on charm offensive that he has the charisma and stature to win. But like every single time he addresses the STL, I find myself asking the same questions: why is Nasrallah resorting to the cloak-and-dagger approach? Why not stick to a principled political argument against the STL? The truth of the matter is that despite the politically formidable image that Hezbollah has created, it has become an organisation far more concerned with winning PR skirmishes than playing a leading role in Lebanese politics. Nasrallah is ultimately trying to publicly manage the STL issue rather than address the root political causes that brought it into being. The political disorientation that prevails in Lebanon means that almost everyone is drawn into Nasrallah’s seductive logic, whether they agree with him or not. Instead of addressing the political questions we find ourselves yet again playing the role of CSI investigators, in a very stark display of how vacuous Lebanese politics has become. And the trend is set to continue. So what is the problem with the STL? The tribunal was set up as a substitute for Lebanon’s weak and ineffectual judicial system. Its mission is to uncover the truth about the assassination of Rafik Hariri and prosecute those involved, tasks that were beyond the reach of the local justice system. March 14’s support for the tribunal was premised on the continuing involvement of the ‘international community’, leading up to the arrest and trial of those involved. Lebanon traded its sovereignty in return for this mandate and the desire of justice, which in all truth was more about political revenge than justice itself. Yet, since the STL was established, neither Hezbollah nor any of its allies ever confronted the tribunal using the sovereignty argument. Occasionally, journalists and commentators sympathetic to March 8 unpicked ‘technical’ items in the tribunal’s charter that were seen as encroaching on Lebanon’s sovereignty. But the blatantly obvious fact that the STL represented a form of international custody of a feeble country was not challenged. All sides seemed to agree that Lebanon’s judicial system is not to be trusted, but none thought that reforming it was an urgent task. It’s telling that even now when Hezbollah and its allies are in power, they are not suggesting that the case be handed back to a reformed Lebanese judicial system. Instead, Nasrallah tonight offered a convenient narrative: let’s agree that Israel was the culprit and move on. Those who are pouring over the ‘evidence’ are missing the point, it’s not meant to withstand scrutiny. Its value lies in its expediency; it represents a face-saving way out for all involved. But the division over the STL in Lebanon is too deep to be bridged by this gesture. There are those who rightly want to find out the truth, but their confidence in the STL is misplaced. On the other hand, there are those who argue that Hariri’s death isn’t more important than thousands of others and it doesn’t merit all this effort to uncover the killers. Both sides seem to see Lebanon as a crippled nation incapable of solving its own problems and dealing with its past. The resistance may have ‘never been stronger’, but Lebanon has never been more divided. For background information on the STL and the Hariri assassination, read my article on the subject. If you would like to be updated about posts on this blog and other articles I publish, follow me on Twitter. The only place where Hezbollah can win or lose is in the public opinions' eye. Every other more systematic process is a lost battle by default. They cant get themselves in the procedures of international channels for obvious reasons. It is not reliable enough neither for them nor for anyone with some commonsense. They cant encourage domestic process as it is easy to bash by oppositions as a less reliable legal activity forced by Hizbollah to coverup the crime. It may actually create more radical reactions than it may help -taking in consediration the sectarian environment in the country. They can only put the public opinion in a position where its hard to ignore the political agenda of STL. If they do so, thats a good start to discuss other alternatives later on - but never before. Obviously, there will always be people who will just ignore anything Hizbollah say and keep on riding the STL horse. But Nasrallah has to do what he has to do. And its safe to say they are good in doing it. 'They cant encourage domestic process as it is easy to bash by oppositions as a less reliable legal activity forced by Hizbollah to coverup the crime.' But that's exactly what Nasrallah is accusing the other side of doing with the STL, they're the mirror image in a way. Accepting this logic means we will never develop independent institutions in Lebanon. If the two biggest political blocs can't address that issue, what's the point of politics then? What's Happening to Beirut's Grand Theatre? The Folly of March 14’s STL Gamble.